After morning pickup at your Boston hotel, travel by air-conditioned luxury coach 45 miles (72 km) south while listening to your professional guide explain the history of Plymouth and the arrival of the first pilgrims on the Mayflower. When you reach Plimoth Plantation, immerse yourself in this living museum where you meet convincing actors who speak old English as they tell you about their daily life in this historically accurate recreation of the small English colony. Watch how the blacksmithing, cooking and farming was done in the early 1600s and feel free to ask questions of the knowledgeable actors. At the Wampanoag home site next to the colony, you’ll meet American Indians from different nations who demonstrate how the Wampanoag's ancestors lived and talk about how they interacted with the pilgrims. They also tell you about how they live in present day and will answer questions. Don’t miss the Craft Center at Plimouth Plantation, where contemporary artisans show the 17th century techniques that American Indians and English colonists used to make tools, pots, headdresses, clothing and furniture. The center aims to preserve the knowledge of these ancient technologies. 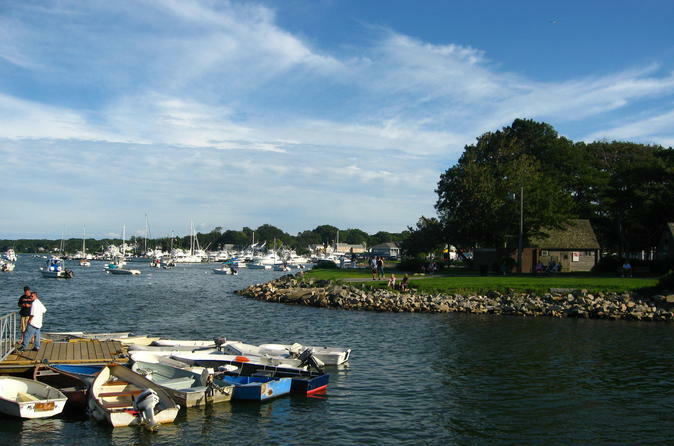 You’ll have free time in to check out the waterfront where you’ll find Plymouth Rock and the Grist Mill. Historical actors describe the journey and living conditions aboard the Mayflower during the Atlantic crossing, bringing history to life with vivid detail as you walk about the ship. Or choose to climb Cole’s Hill, a National Historic Landmark, which contains the first cemetery used by the pilgrims in 1620. After you have explored the living history at the Plimoth Plantation, your coach returns you to your Boston hotel. Mayflower II is in drydock, Grist Mill is offered instead. Special Offer - Book and travel by September 16 and save 10% off our previously offered price! - Book Now!